“ductile flexural failure”: After yielding of the reinforcement, if no redistribution of forces is possible, the deformations of the beam become important while the structure deflects in a ductile manner. The compressive flange of the beam softens and the center of rotation of the sections goes down, reducing the internal level arm. Ductile flexural failure occurs when the ultimate capacity of the concrete compressive zone is reached. The flexural failure is governed by concrete crushing after yielding of the steel. Indeed, the deformation capacity of the steel is normally not crucial. in the web of the beam or “shear flexure failure”, see Figure. 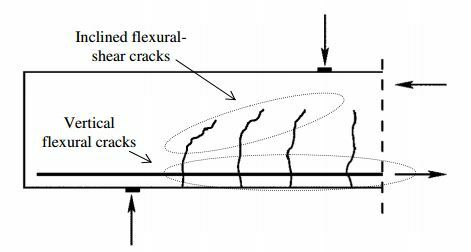 Due to high local tensile stresses in the web the “inclined flexural shear cracks” propagate, see Figure, and reduces the capacity of the different possible shear transfer mechanisms. When the shear transfer capacity between two neighboring portions of the beam becomes too small, a static equilibrium cannot be found. A relative displacement between the two neighboring portions takes place. The shear failure mechanism is characterized by shear sliding along a crack in beam without shear reinforcement and yielding of stirrups in a beam with shear reinforcement. In the case of a beam with huge amounts of reinforcements failure may occur by crushing of the concrete in the compressive zone before yielding of the flexural reinforcement. Compression failure of the web due to high principal compressive stresses in the region between induced shear cracks. This failure mode is normally associated with high amounts of shear reinforcement but may also be critical in sections with thin webs. In the case of Prestressed elements, a very brittle shear failure, starting at middle height of the web, may occur, without any prior flexural cracks. This failure mode is called “shear tension”. Unlike non-Prestressed flexural elements, the initiation of a web shear crack leads to an immediate and unstable crack propagation across the section. For a beam without stirrups if a “shear tension crack” initiates in the web it will therefore lead to the collapse of the element.